Known to many slot players as a fruity, slot games have been long since been associated with fruit, featuring colourful cartoon fruit symbols since day dot and as you can see fruit slots are still a reoccurring and popular theme for slot games. Call it tradition, good luck or a completely bananas pairing, but everyone loves to see shiny fruit symbols spinning around the reels. You’ll get a lot more than your 5 a day with this action-packed, fruit stall inspired slot game. The theme really packs a punch and is a modern fruity twist on the classic fruit machine slot game. Your local fruit shop may have long since closed its door for business, but fear not, you can still get your vitamin C fix and a healthy dose of nostalgic when you play Fruit Shop on Easy. Get playing now to win free spins! Fruit slot is a classic slot game with 5 reels and 3 rows played across 15 paylines. The minimum bet for this slot game is 0.15 coins, and the max bet is 150 coins. Keep your eyes peeled for the juicy Wild symbols which can be substituted for any symbol on the reels, however, in the Fruit Shop all pay lines with a Wild symbol will pay double. Better yet, during free spins, the Wild symbol could quadruple your stake. Just to squeeze every last juicy drop out of the game, any time you win during a free spin, another free spin will be triggered! You can’t ask for juicier than that. To win this game you will need to very simply match three or more symbols on the reels, so the game itself is relatively simple and classic in form, so you don’t have to be an experience slot player to enjoy and win this game, making it perfect for beginners. However, this game will certainly keep you on your toes and have you hungry for more as the gameplay is both smooth and fast-paced as well as being surprisingly lucrative, especially with the combination of Wilds and free spins which are accumulative. A classic sweet treat that can be enjoyed by both experienced players and those who are new to online slot games. 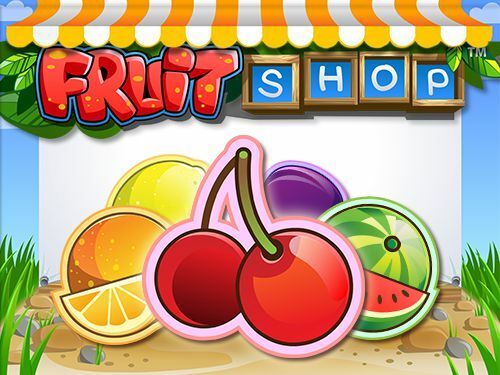 The game is simple and the theme is well executed throughout the game, with colourful fruit symbols including cherries, lemons, plums, melons and oranges, surrounded by the cartoon style fruit shop stall, giving it a classic and nostalgic look and feel. Try more of our online UK slot games now.